To ensure optimal safety and safeguard human health, the food and beverage industry requires that parts comply with a number of specifications, from BPA-free and nontoxic guidelines to FDA-certified and GMA-safe regulations. For plastic injection molding food service applications, various food grade materials are used in the process. Our automation capabilities allow us to complete custom, high-volume projects on a global scale. Utilizing highly automated equipment and fully robotic processes, we can offer customers cost-efficient products and just-in-time shipments without sacrificing quality. Each machine in our facility is equipped with either a robotic sprue picker or full servo-robot to boost efficiency, and Baxter, our first collaborative manufacturing robot, efficiently expedites the most repetitive production tasks. Every press is microprocessor-controlled and self-diagnostic to ensure full operational efficiency, and all products are dimensionally checked using our KEYENCE Vision Inspection or our Mitutoyo QuickVision System. Rodon is proud to provide a turnkey manufacturing solution for the food and beverage industry. From custom designing the mold to manufacturing the part and performing a final two-step inspection, every phase of the process happens under one roof — giving us maximum control over production, communication and quality. Our team works with industry-leading resin suppliers to create the highest-quality products available and, with a fully automated facility; we can easily handle high-volume orders. 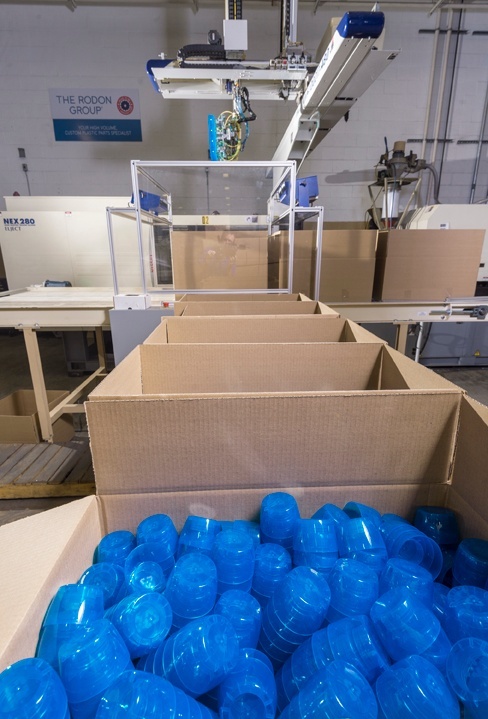 To see some of the plastic parts we’ve manufactured for this industry and learn more about our food and beverage mold manufacturing capabilities, visit our comprehensive case studies page.